George Graham reviews Sidestepper's "Supernatural Love"
The world music scene has brought forth a lot of interesting variations over the years, especially since the 1980s, in the wake of Paul Simon’s groundbreaking album Graceland. That recording created a lot of interest in styles from what had been considered Third World countries. Initially, a most of it was authentic sounds from the regions, but it was not long before there were quite a few interesting hybrids happening. We have noted quite a few on this album review series over the years, and this week we have another example of a kind of cross-cultural band who took what turned out to be a roundabout journey to the more authentic, organic sounds. The group is Sidestepper, and their new recording is called Supernatural Love. Sidestepper had its beginnings in 1992 when English producer and DJ Richard Blair was working as a recording engineer on a project for Peter Gabriel’s Real World Records with Colombian vocalist Totó la Momposina. After the London sessions, Blair then journeyed to Colombia to visit her at home and find out more about the music. He ended up staying three years and working with Colombian artists as a producer. After Blair returned to England, he made the first Sidestepper album Southern Star in 1997, and struck up an association with Colombian singer-songwriter Ivan Benavides. They specialized in electronic dance sounds with Latin American influence. Sidestepper made a series of albums over the years, including an influential album called 3 AM, In Beats We Trust in 2000. Their last full new studio album that was not a collection of remixes, was in 2006. Now Sidestepper is back, with a new release Supernatural Love, recorded in the band’s own studio in Bogota with a somewhat revised personnel lineup led by Blair. The album represents a kind of full circle for the group. After being known for their “electro-cumbia” sounds, the band has turned to mainly acoustic instruments with all the percussion played by people, rather than electronic dance beats. It often has the sound of authentic folk music, but it’s a definite hybrid of influences and cultures. It’s partly in English, partly in Spanish, with some songs going back and forth, and a mix of percussion that can hint at both South American and African sounds, some some occasionally rustic-sounding flutes that could be from Africa or the Andes, and some Caribbean island influence. The result is rather intriguing. Blair’s background in dance music comes across in the groove-oriented nature of the music, and some of the tracks tend to focus on a kind of trance-like quality without a lot of musical variation, but hearing it with mostly acoustic instrumentation and percussion played by hand, sets it apart from contemporary dance music. And it’s hardly traditional with the various influences that are thrown into the sonic pot. It comes out as an appealing recording, but some of the pieces seem to run a little long except perhaps if you were on the dance floor. Supernatural Love, the new release by the international, Colombian-British group Sidestepper is the first new all new project from the band in 10 years, and it marks a change from their previous electronics-dominated sound to a much more a organic approach with almost no synthesizers, and most of the the music created with real percussion and other instrumentation and vocals. It gives the band a more authentic sound, though the group’s electronic dance origins are evident in the way the tracks go on in a similar groove, which is more conducive to dancing rather than for foreground listening. Still, there are a lot of interesting sounds and ideas to be heard. It’s an appealing, honest kind of sound. Our grade for sound quality is about a B-plus. Sometimes things are a little murky in the mix, but overall it’s better than the contemporary average. The dynamic range, how well the recording preserves the differences between loud and soft, is OK for this kind of music, but hardly at audiophile level. The number of variations within the world music scene seems to be endless these days, opening the door for a lot of interesting cross-cultural fusion projects. 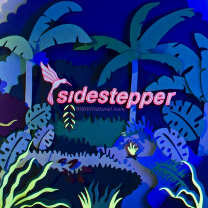 Sidestepper’s new album, creates such a blend that is both distinctive and danceable.